One of our resident song sparrows hasn't been having a good year. It seems like every time she builds a nest and fills it with eggs, I accidentally impact it while gardening, then the mother bird abandons her offspring. As much as we'd like to allow her to hatch some chicks, Mark pointed out that there's no reason to let abandoned sparrow eggs go to waste. So when the third nest came out with some raspberry primocanes, I decided to add the sole egg to our lunch. I boiled the sparrow egg up while cooking sweet corn, let the egg cool slightly, then shelled it out and put the tiny morsel on top of our Swiss chard. The egg was nearly entirely yolk and tasted delicious...perhaps because of the garlic butter it soaked up. Granted, sparrow eggs will remain in our survival-food category despite the flavor. After all, it would take about a dozen of them to make one chicken egg, and who wants to negatively impact the local song-bird population? 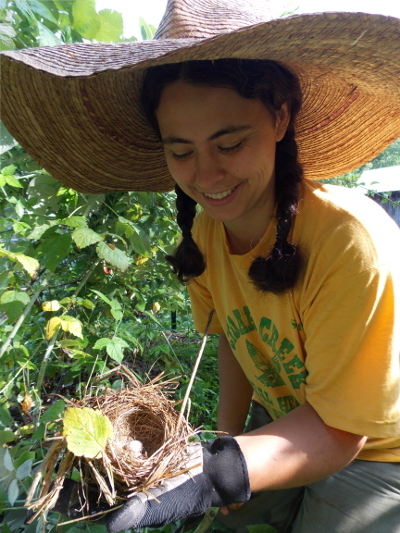 But if I find more abandoned nests around, I'll definitely cook up the bounty. The Avian Aqua Miser is a POOP-free chicken waterer enjoyed by poultry around the world. I know what you did was good and you were trying to not let things go to waste, but I wouldn't post that on the web. Sparrows, their nests and their eggs are protected by the Migratory Bird Treaty Act. Channing --- Hmm, I don't think that would be relevant since Song Sparrows aren't migratory. It is silly I know. There seems to be unlimited #s of those things, but they are protected. The song sparrow is actually listed by the US Fish and Wildlife Service as a migratory bird protected by the treaty. I personally don't care that you ate the egg, but just thought you might like to know for future reference. If you go to http://www.fws.gov/migratorybirds/regulationspolicies/mbta/mbtandx.html#s you can find a list of all the birds listed as migratory including all the various sparrows. Channing and Virginia --- Looks like you're both right! It sounds like they must migrate somewhere even if they're year-round residents here. I guess we won't be eating any more eggs. I wonder if someone will tell you, with the way the law reads, its okay to 'eat the egg but not the bird' I wouldn't know, just wondering.